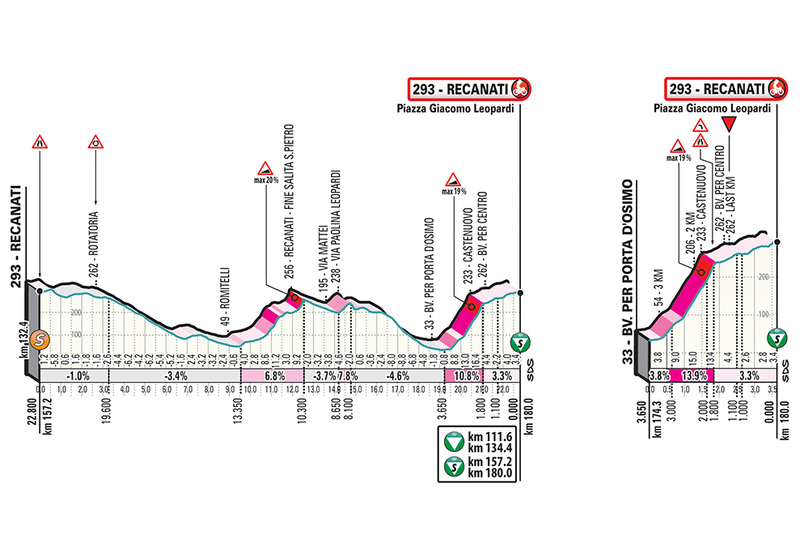 The 2019 Tirreno-Adriatico NamedSport is set to be a different Race of the Two Seas, thanks to the new course featuring ‘walls’, the traditional punchy climbs of Central Italy. Like last year, the seven-stage race has attracted many great cycling aces on the provisional entry list, announced today. The race, organised by RCS Sport / La Gazzetta dello Sport, runs from 13 to 19 March. The ‘walls’ will open the potential for a final GC victory to different styles of riders beyond the traditional GC contenders. Unchanged from the previous editions are the two Time Trials, the opening one for Teams and the final one for Individuals, plus there will be two sprint stages. 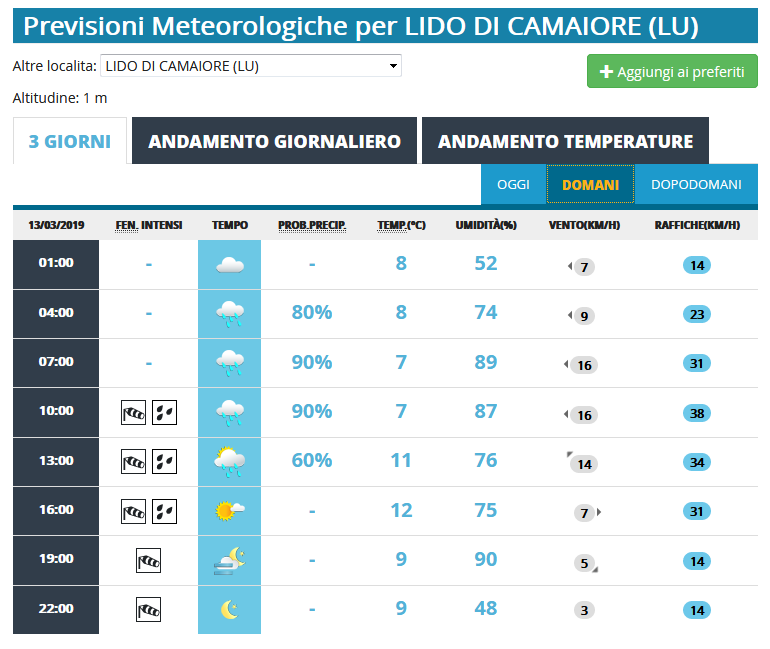 The traditional team time trial on the Tyrrhenian coast kicks off the Tirreno-Adriatico. At 21.5 kilometres, the route is a copy of last year's race. Expect high speeds as the course is fast and flat. 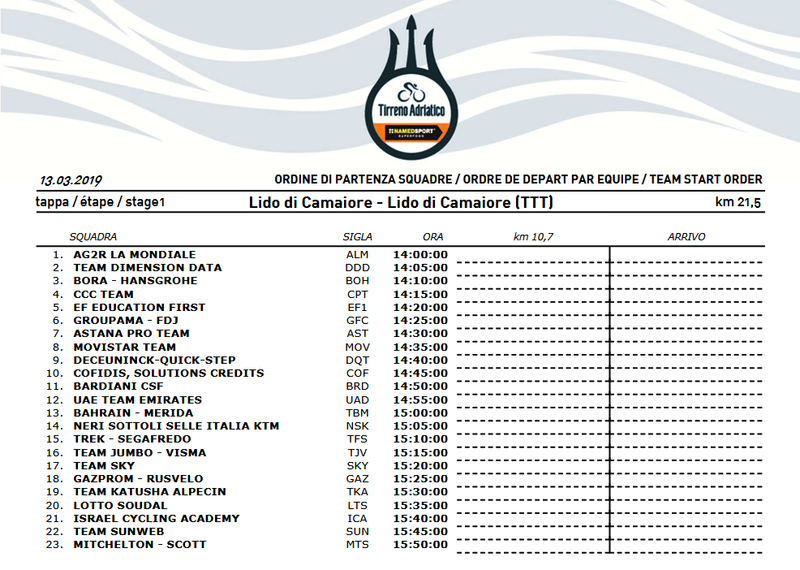 The last three Lido di Camaiore TTT’s were all won by BMC, so the race will definitely see a new winner on the first day of action. 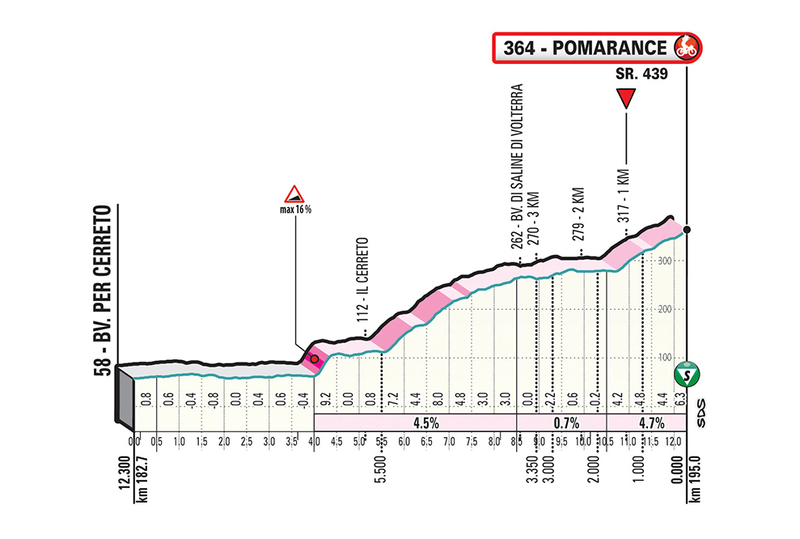 The 2nd stage of the Tirreno-Adriatico is a hilly race of 195 kilometres to Pomarance. Zdenek Stybar and Geraint Thomas are previous victors in Pomerance, respectively in 2016 and 2017. The finale is a copy of two years ago, which means the race concludes with a moderate climb of 12 kilometres. The uphill begins with a section at 4.5% before an intermediate false flat continues to the last 2 kilometres at 4.7%. 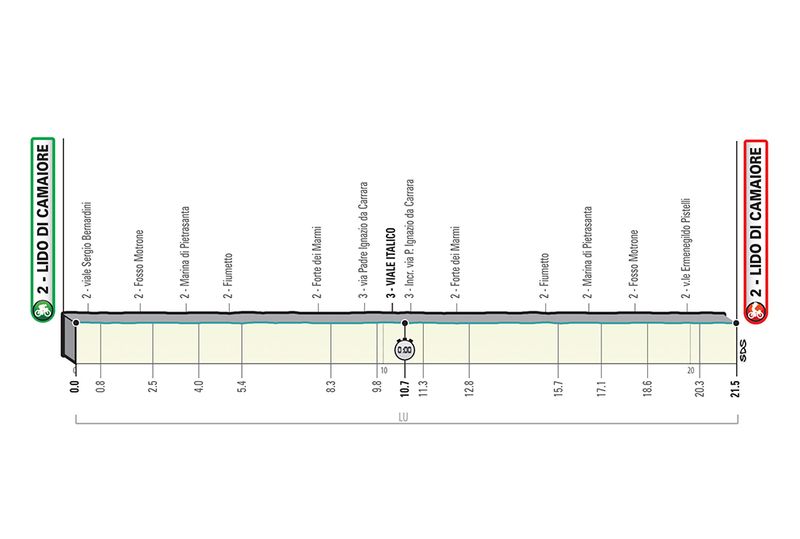 The 3rd stage in the Tirreno-Adriatico is far from flat, but chances are the race will come down to a sprint anyway. The route amounts to 226 kilometres. It is the fourth time that Foligno hosts the arrival of a stage in the Tirreno-Adriatico. The last occasion was in 2016, when Stephen Cummings powered to victory with a late attack. 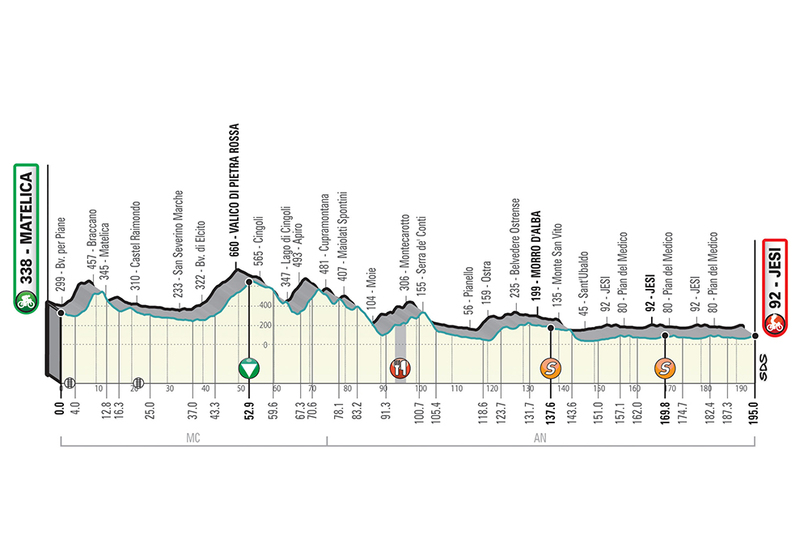 At 221 kilometres, the 4th stage of the Tirreno-Adriatico is a war of attrition. 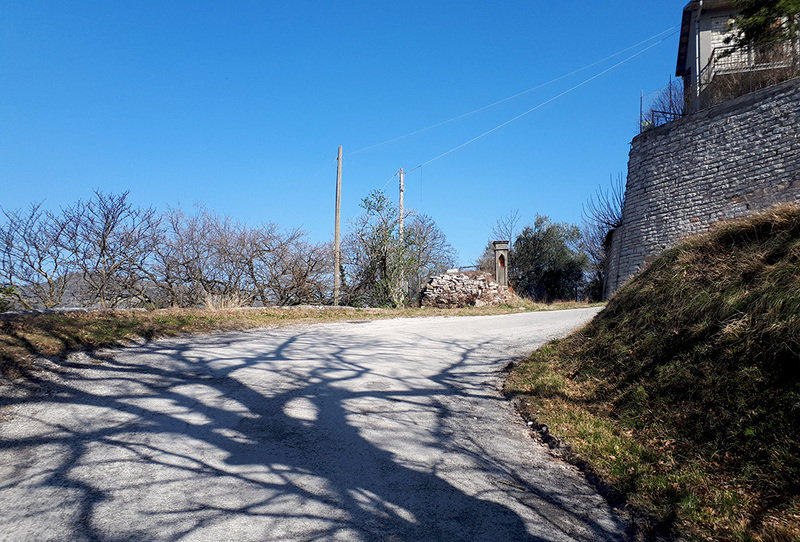 Running from Foligno to Fossombrone, the route is marked by steep climbs on narrow roads. Think Liège-Bastogne-Liège in Italy. 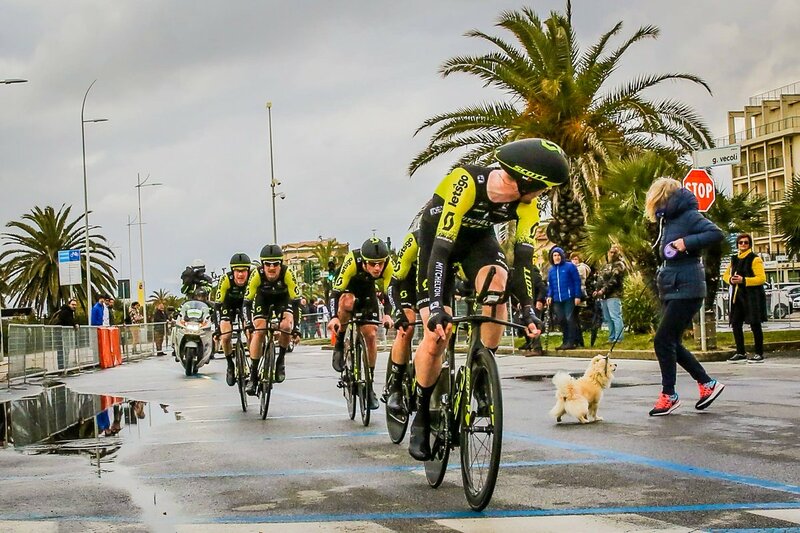 The race is emblematic for the 2019 edition of the Tirreno-Adriatico. No long climbs, instead the route is dotted with short and sharp ascents making it a tough stage indeed. Possibly the hardest of this edition. 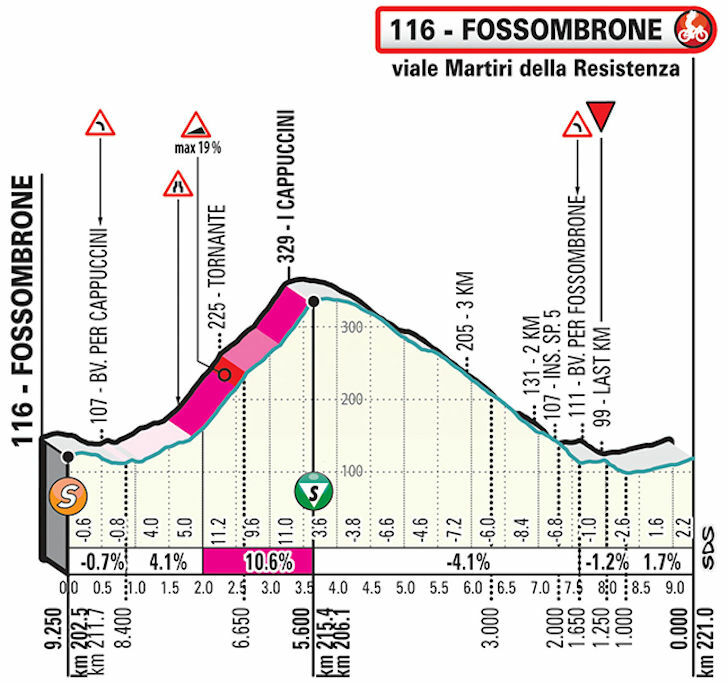 With almost 20 kilometres remaining the riders enter a circuit around Fossombrone, which is raced twice. It includes a double pass over the Muro dei Cappuccini, a double digit climb with its crest 5.6 kilometres before the line in Fossombrone. The finale is a flying descent. 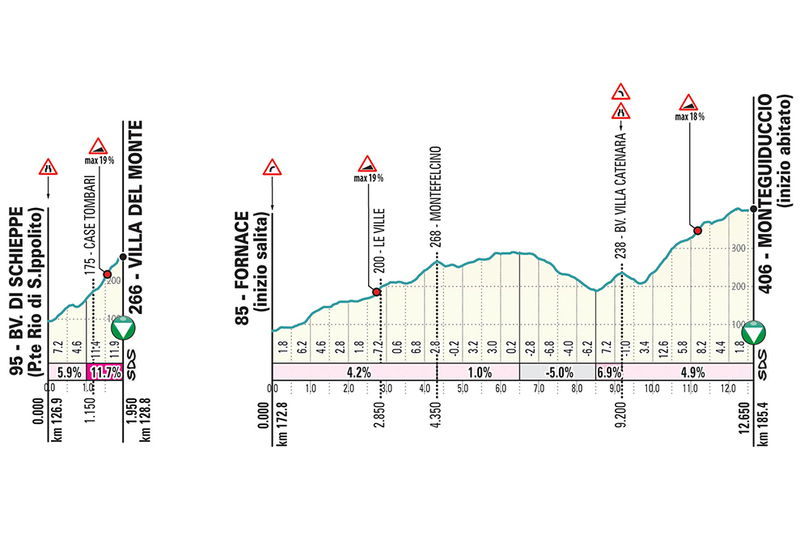 The 5th stage brings another hilly day in the Tirreno-Adriatico. 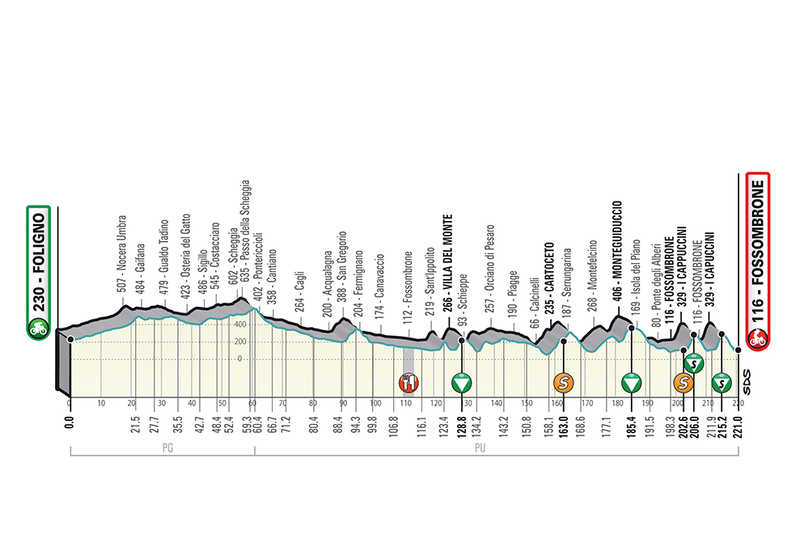 The 180 kilometres route leads from Colli al Metauro to an uphill finish in Recanati. The climb to the line kicks up at 19%. The last 85 kilometres feature nine consecutive climbs. 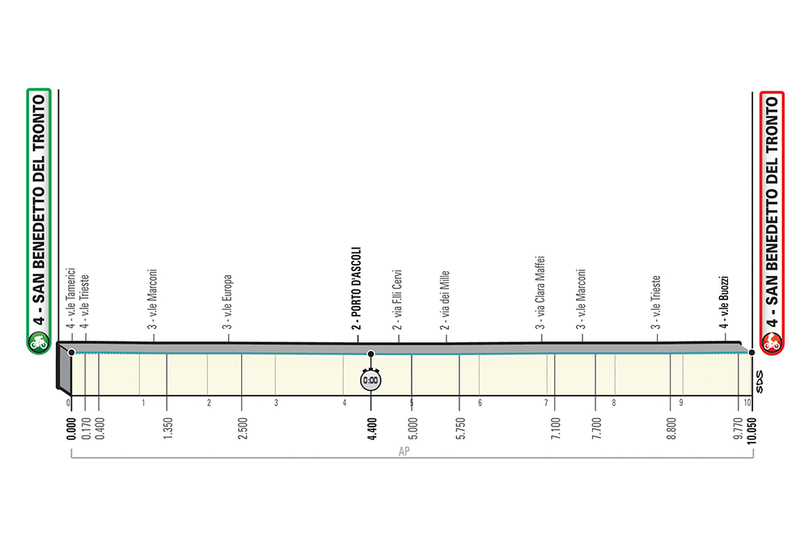 Following the first passage on the line the riders face three more laps of 22.8 kilometres. The route drops down to the first ascent, which is crested 7 kilometres before the kick up to the finish line. The climb to the line is especially demanding with ramps up to 19%. The first half slopes at 10.8% before it levels out to 3.3% in the second half. The length of the ‘Wall of Recanati’ is 3.6 kilometres. 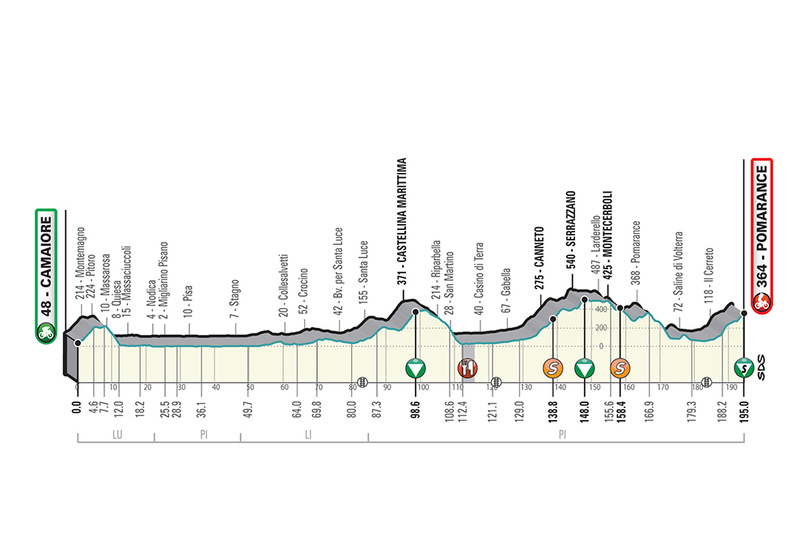 At 195 kilometres, the 6th stage of the Tirreno-Adriatico runs from Matelica to Jesi. Although the first half is rather bumpy the race is likely to see a fast finishers showdown. The finale is a 12.6 kilometres circuit around Jesi, which is covered three times. 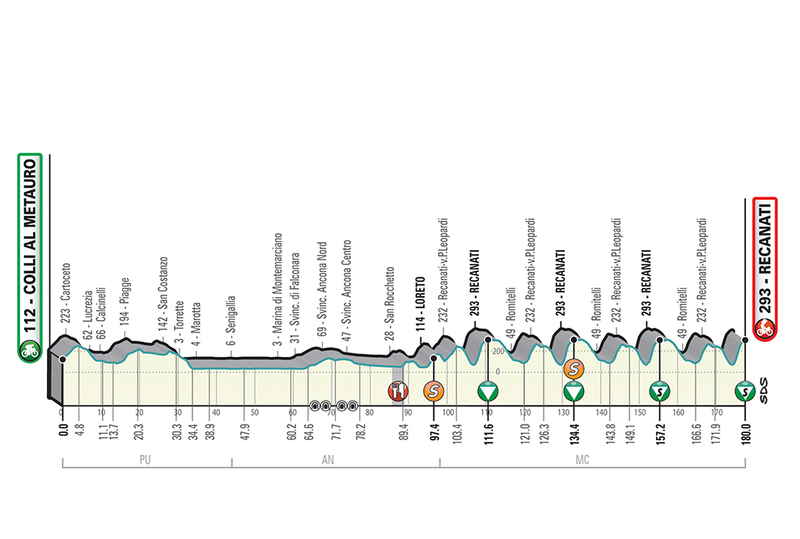 The last stage of the Tirreno-Adriatico is the traditional ITT up and down the flat Adriatic seafront. The route in San Benedetto del Tronto is 10.05 kilometres long. 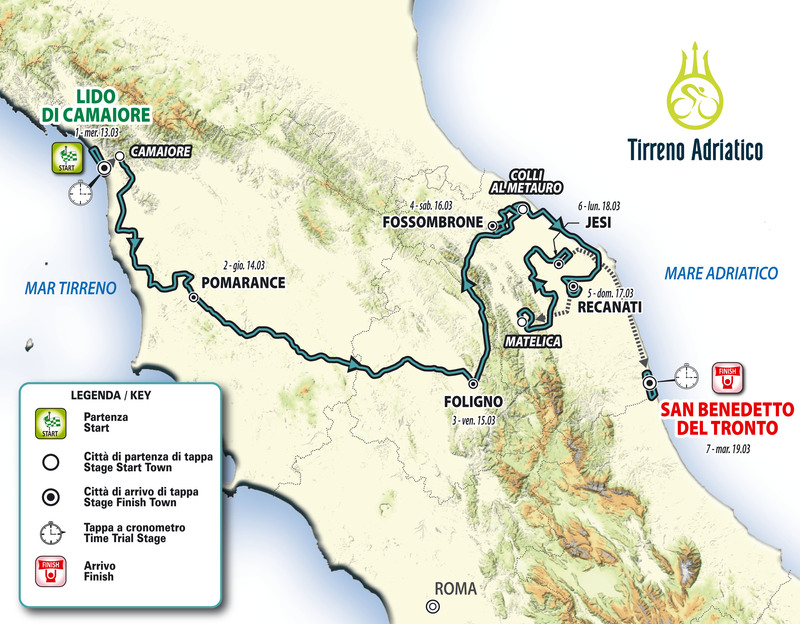 The Tirreno-Adriatico’s last stage represents a longstanding tradition. The race ends in San Benedetto del Tronto for the 53rd time in 54 editions. In last two editions, Rohan Dennis powered to victory in San Benedetto del Tronto. Michal Kwiatkowski finished in twelfth to seal the deal and lift the winner’s Trident trophy. 5 teams have received a wildcard invitation to join this World Tour race. Interesting parcours, without any big climbs. First team off the start at 13:45, last one at 15:30. There are not many corners, but it still could mean quite a difference in terms of road conditions. I guess it falls to me to fill in how the day's events unfolded. Well, the race began under leaden skies, over damp roads and it turned out to be a trial in more than the intended sense. Anyhow, the early leaders EF were soon surpassed by those perennial winners, Deceuninck - Quick Step and they held the lead for quite a while, until pre-stage favourites, Team Jumbo-Visma knocked their time out of the park. They look odds on to win, as various teams came home well outside their time, until there was a single team left to finish, Mitchelton-Scott. Adam Yates's team of big boy roulers were ahead of the Roglic lead Jumbo all along the course. However, the fat lady hadn't yet sung and within the final km a thin lady arrived, almost to steal her Aussie backing band. Where these double whammy incidents leave the organizers and the marshaling/policing, I know not, bearing in mind how a couple of years ago, a similar incident, again involving Sagan, occurred on their other, "wide open" ITT course. Enough said for now, so onto the stage results. Footnote: One rider was OTT and unfortunately, it was the guy who has had so many team issues: Nacer Bouhanni. there was a single team left to finish, Mitchelton-Scott. Adam Yates's team of big boy roulers were ahead of the Roglic lead Jumbo all along the course. In the end, the conditions did have an influence by the way (mainly for the first teams, running on very wet roads) but not really in regards to the result at the top, I think. The split times show some of the early starters up there on the table though, so I guess when the rain stopped, there also was a slight change of wind direction. Especially as late startes like Lotto, Cycling Academy or Trek pretty much jumped up the ranking in the 2nd part. But as it basically was just a "one way down the road, turn around, come back" kind of course anyway, it probably didn't have a major influence. 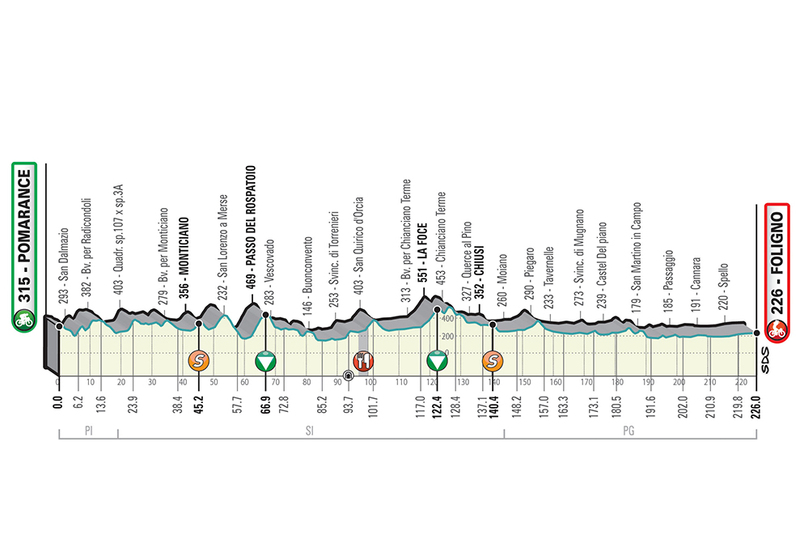 I know there are some riders that prefer the Tirreno- Adriático because of RCS generally offering better hotels than the ASO-hosted races, but how much sloppy safety work are they really willing to tolerate? Urban TT courses should be fenced off, because the cyclists come at much higher speed than the cars that travel the street every day. This is hard for people who walk there several times every day to adjust to. Saw that here during the worlds, the cyclists arrive like in a flash and people just fail to adjust to the fact. On one particular dangerous spots they put fences all the way, to make sure only official crossing points were used, guards on both sides of the street and ropes for them to control acces to the crossing. Personal experience from that location, a group of cyclists at 60-80 km/h (just after downhill) is extremely fast in a street where cars rarely go faster than 30 km/h. Even waiting in line, that was quite scary. Fences + controlled crossings are a must at these speeds in urban areas - where you must expect someone to be there on other business while the race is on..
"It's even more incomprehensible because when we came to recognize the course with the chrono bikes, everything was going well. Nacer was eager to compete with Viviani and Gaviria, and then, today (yesterday), he did two stints at the front, and just dropped. When I went to tell him, 'Attention, the time cut is very short in this kind of exercise', he told me not to worry ... "
Pinot said the weather had a major influence for them, by the way. While they had to approach corners at 35 kph in the wet, Jumbo or Mitchelton could do them at 60 kph in the dry, and with less wind. He recons it cost them somethiong around 20-25 seconds. The day’s breakaway, which formed in the opening 20km, consisted of Natnael Berhane (Cofidis), Stepan Kurianov (Gazprom-Rusvelo), Sebastian Schönberger (Neri Sottoli-Selle Italia), Mirco Maestri (Bardiani-CSF) and Markel Irizar (Trek-Segafredo). The action was sparse until the 20km mark, when Deceuninck – Quick-Step hit the front and started to drive the pace on a descent, causing a momentarily split in the peloton. Peter Sagan was dropped early on and rode home with battered team mate Rafal Majka, in the bus. At least they fared better than Sky's Gianni Moscon, who was forced through sickness to abandon. The road ramped up to 16 per cent at the 8km mark, sparking Mitchelton-Scott into action as they drove up the pace to test their rivals. Daniel Oss was the first launch an attack 5.9km from the finish, holding a slim advantage for less than a kilometre before being swept up by the driving peloton. The attacks finally split the peloton, as a small, elite group formed at the head of the race. Inevitably, the GC contenders failed to cooperate and were caught with just over a km to go, leaving Alaphillippe and Van Avermaet to contest the uphill sprint. Sagan had a puncture at 22 km to go, though. He may well be at the front again tomorrow, and maybe even on the weekend, stage-hunting. don't know. He said he was sick all week, and having seen him on the bike today, that actually could be the truth this time. Yeah, I think the clue here is at 22kms to go. But I do expect him to turn up at some point. If not tomorrow, then on stage 6. Not sure he will be fit enough for those weekend ramps. Sagan would need to be in uber shape to be competitive on those ones, can't really see that happen. A completely forgettable stage, but for the fact that Sagan decided to get in the mix and split the Viviani/Gaviria battle. also the descent is fairly technical, but probably a bit too short for Mohoric to make up the time he loses on the climb . Or will he attack it the first time round?! also the descent is fairly technical, . . .
Well, that assessment was a bit understated for the conditions! What a cracking race! Hoping Boswell is ok, tho - looked like he got knocked out for a minute or two. yeah, great racing yesterday, I didn't expect the race to explode with 40k to go - and neither did the organizers I guess, they were really struggling to get all the lapped riders out of the way on the finishing circuit, and it took hours afterwards to get the result sorted . Massive showing by Lutsenko though. It was him who made the race this hard that early. Went solo right afterwards. Crashed twice on the descents. Still won the final sprint. Especially with all the tired legs from yesterday's long and hard stage, this could create fairly big gaps I guess. If you are looking to find a balance for having two time trials entrenched in a race, then there's a lot to be said in support of this year's parcour, over the traditional big mountain top finish. Instead of the usual couple of kms of trying to put the boot into opponents, the weekend has seen action from the GC contenders, for well over 60kms of racing. 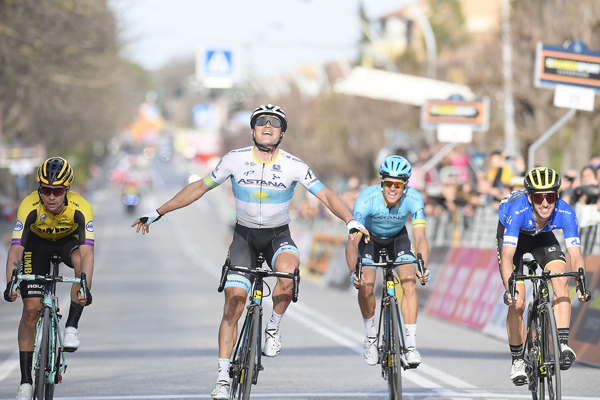 Today saw Astana complete the second leg of the weekend double and also made it a Mediterranean Sunday double. First, Dario Cataldo reduced the peloton to just half a dozen or so riders, including the blue jersey of Yates and his main rival Roglič . Astana then launched Fuglsang over the top of the penultimate ascent of the Muro di San Pietro, after Alexis Vuillermoz and Tiesj Benoot had tried their own attack. Together, Yates and Roglič (with the latter mostly sitting on the former’s wheel) set off in pursuit of Fuglsang, in the process picking off the final remnant of the day’s initial break. At this point a honourable mention has to go to Mads Pedersen who died several deaths on the final lamp ramps, but still held on to finish 7th on the stage. At the foot of the final climb of Muro di San Pietro, 3km from the finish, they remained 52 seconds adrift, and 42 seconds ahead of a chasing group of other GC contenders, including Dumoulin . Roglič laboured to hold Yates wheel on the steeper gradients of the climb, and was dropped altogether 2km from the finish. Yates was however unable to catch Fuglsang, who, after his advantage had dipped to around 30 seconds, held his nerve to claim victory. Those were really two great stages over the weekend. Too bad though, that both WT races again didn't manage to co-ordinate each other about racing schedules... it almost seems like that try to finish at exactly the same time. This way, it was really hard to follow the race, and there also was almost no live coverage of Tirreno, outside Italy. There is some rain and wind, but overall it should be a fairly straight forward sprint stage I guess. Also, contarry to Friday's stage, the finish is not too technical. "The final circuit, measuring 12.6km in length, is perfectly flat and runs between wide, well-paved city roads and the surrounding countryside (where the surface is worn out at points). The final 3km are raced entirely on urban roads, with a last bend 1,000m before the finish. The home straight is on 8.5m wide asphalt road with a mild uphill gradient", is what it says in the roadbook. Sounds very much like it's another battle between Viviani and Gaviria on the cards. It'll be interesting to see what Sagan will do though. He was 2nd in the other sprint, but apart from that, he really didn't look any good in the race so far, or anywhere close to what he's usually doing here to prepare for the classics. May he even join the breakaway today!? I mean, he needs to go deep at some point and get into some racing shape, otherwise he can forget about being competitive in the classics. The poor showing of the sprinters today did make me think of Sean Kelly and the build up to his final MSR victory. He said in an article discussing that victory that at TA the week before he knew he was in good form, but didn't want to put his head above the parapet and become a marked man at MSR and so didn't give it his all. So was Gaviria's 63rd a bluff today? I guess we'll find out in a few days. in a battle for less glory, Mirco Maestri joined the breakaway for the 4th time in 5 days today and took over the lead in the sprints classification. He did the same thing two years ago and just lost out by two points against Peter Sagan. To be more succesful this time, he now needs to hope for Roglic to not finish higher than 3rd tomorrow (with also Yates, Alaphilippe, Fuglsang and Viviani still having a theoretical chance to win it, but it's probably mostly Roglic he'll need to worry about). Maestri will be happy to see, that with Tony Martin, Tom Bohli, Victor Campenaerts, Jos van Emden, Maciej Bodnar, Michael Hepburn, Stefan Küng, Yves Lampaert, Luke Durbridge, Mads Pedersen, Nelson Oliveira, Jonathan Castroviejo and Tom Dumoulin the competition for Roglic is basically as good as it can get. It's the ninth time the race ends in this fashion, and with Andrey Amador skipping Tirreno this year, Vincenzo Nibali and Maciej Bodnar are the only riders left to have participated in every single San Benedetto del Tronto time trial so far. With Dumoulin in 4th already sitting 1:20 behind Fuglsang in 3rd, the three names who'll enter the overall podium should be settled, but as Yates only has a 25 second lead (actually it's 24.50s only, taking the exact times from the TTT into account) over Roglic, the battle for the victory should still be a close one. ah, and one big question is missing up there: after eight years in the Pro Tour, will Rohan Dennis become the first ever WT stage winner on a Merida time trial bike? The total number of wins (on international level) is two so far, I think. Malori won one time trial in Coppi e Bartali 2013 and Ulissi in Slovenia 2015 (but it was kind of a MTT, so not sure if time trial bikes were used or not). The 20 second video clip of that groad segment will live forever. 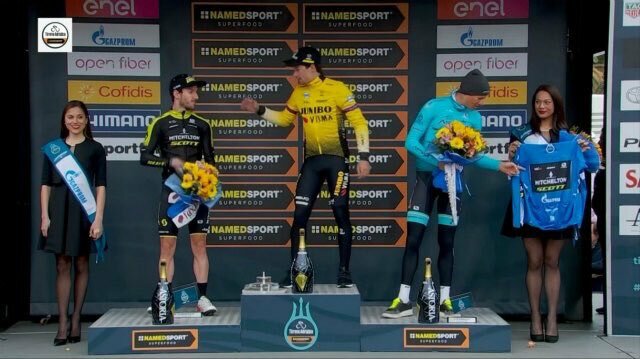 while Primoz Roglic took the overall. By 0.81 seconds. The stage was won by Victor Campenaerts, clearly showing good shape heading into his hour record attempt. Some of the most surprising results of the day came from the EF boys, particularly Alberto Bettiol, who was 5 seconds faster than everyone else in the 2nd part of the course. Nice story. I'm happy for him. By the way, in the roadbook, the points jersey is described as red (maglia rossa). Any idea why it's actually orange (arancione)? 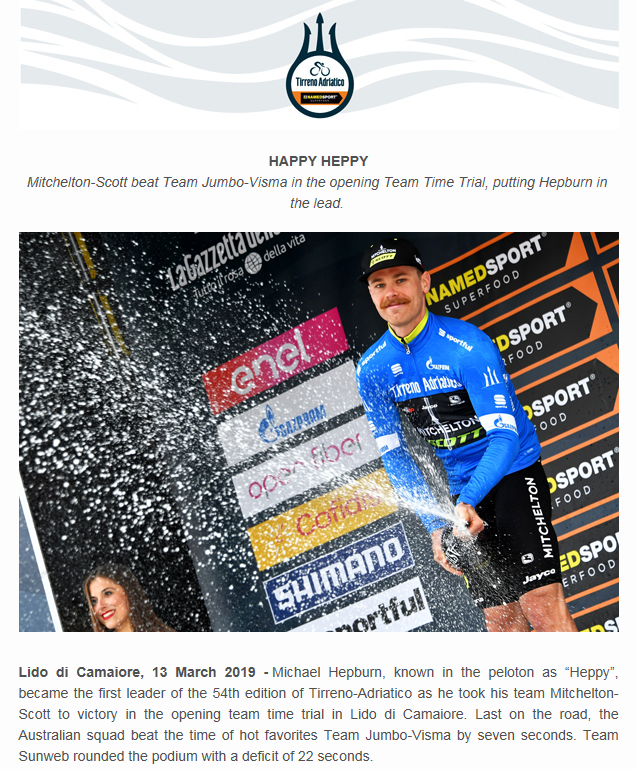 On page 5, when listing the sponsors, it says "MAGLIA ARANCIONE"
From the organisation that doesn't have the right sponsors on the leader's jersey for the final podium and can't properly secure a TTT route, this sounds likely, even.